Demo album by Sean Dowdell And His Friends? 5.1 Sean Dowdell And His Friends? Since Chester Bennington learned how to talk he had been telling everybody he was gonna grow up to be a singer. His brother played Foreigner records all the time and by the time Chester was two he used to run around singing their songs. His mother recalls how he would sing and act out all the parts from the 1980 musical comedy film Popeye for everyone that came over to the house. As Chester grew older, he started developing his distinctive singing style. "I did it all the wrong way. I basically went at it till it didn't hurt anymore. Its something I've been blessed with." His favorite band was Ministry and he would always try to mimic Al Jourgensen's highly produced/compressed vocals the best he could, without using any effects. Other groups he listened to were Depeche Mode, The Cure, The Misfits, Fugazzi, Minor Threat, The Smiths, Skinny Puppy and Neitzer Ebb. In school, he got into musical theater, started playing music, and traveled the country with a stage production of You Are The Child. One of his friends was a pretty good guitar player and was looking for someone who could sing. Chester said "I can sing." So they both broke into the church behind a house, stole a microphone and started doing music together. They learnt every The Doors song they could play and when Chester started doing his first compositions, they were very influenced by them. He said, "We liked them as they were so poetic, spacey and deep. So it was something along those lines." This opened the door to some other young musicians that have been in bands and they invited Chester to be in his first band, Sean Dowdell And His Friends?. Sean Dowdell was 17 when he started working for Rob Rogers, manager of local bands in Phoenix who at the time worked for Little Ceasars. In June 1992, after Rob broke his ankle while golfing, Sean came to visit him in the hospital and told him he wanted to form a band and wanted his help. In the 11 months they had been working together the two became good friends, so Rob quit his job with Little Ceasars to become his manager. Sean planned an audition at the Greenway High School in Phoenix and that’s when they met Chester. The name "Sean Dowdell And His Friends?" was originally suggested as a joke. Sean said, "At the time we couldn't think of a name so I shouted something stupid out and it we all laughed and used it for about a year or so as the name." Sean grew up in a musical family, with roots that go back to his dad and uncle and musical influences which range from Kiss to Depeche Mode, R.E.M., U2, and Alice In Chains. He was particularly a big Gene Simmons fan and was very much into merchandising. Once the band was put together, they wrote about 10 songs and learnt about 10 cover songs including "I Wanna Be Sedated" by The Ramones, "Would" by Alice In Chains and other songs by Stone Temple Pilots, Guns N Roses, and Pearl Jam. None of the members took the band very seriously, but soon they had a following and started producing marketing material such as t-shirts, flyers, stickers, and pictures of the band. They also recorded a self-titled cassette tape containing 3 of their original songs — their only songs ever recorded in studio. The photographer responsible for the demo tape cover was Sean's uncle Mike Walliser. For over a year and a half, they played 50-70 shows around the Phoenix area. Some of them taking place at the Greenway High School, where Chester and bass player Jason Cekoric went to school. Chester was constantly late to practice and it became a problem for everybody in the band after a while. When he got in trouble with drugs at school and his dad (a police officer at the time) grounded him for a long time, it also affected things with the band. Chester was reportedly kicked out after he had a fight with Rob Rogers. The band brought in an older singer named Jack Shoots with whom they played a few rehearsals and one show before Chester returned. However, the band had run its course by that time and it ultimately ended. Jason Cekoric and Chris Goad were in another band called Genocide at the time, so after the breakup they started focusing on that band. As for Chester Bennington and Sean Dowdell, they would play together again in a band called Grey Daze. In 2008, Sean said he had not seen either Chris G. or Jason C. in at least 12 years. Chris Goad says the Grey Daze song "Starting To Fly" was originally a Sean Dowdell And His Friends? composition. According to Jonathan Krause, the Grey Daze song "Wake Me" was written during the Sean Dowdell And His Friends? days as well. 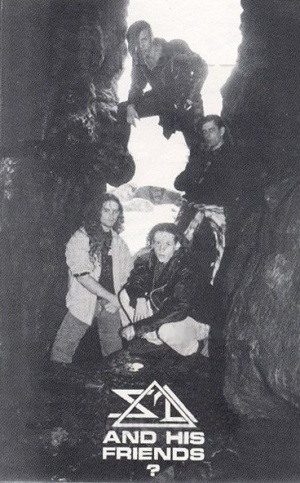 The band started looking for options to record their first demo of original material at some point in 1993 and ended up recording a 3-song cassette in Pantheon Studios with producer Tony DiMaria. The "Kill The Flies" lyrics printed on the tape's insert are almost entirely different from the ones on the actual recording. The first verse is almost the same, but the rest of the song is drastically different. It looks like these are earlier lyrics that probably were changed just prior to recording. The line "Look to the sky, its a spy" that is absent from the actual track is likely a nod to a very similar line from a song called "Ocean Size" by Jane's Addiction. "We manufactured and printed 200 cassettes. I know that over a hundred of them were destroyed and the other hundred were primarily sold to fans. Cassettes generally don't have a long life in the heat of Arizona," said the band's manager, Rob Rogers. Over 1/2 of these tapes were destroyed due to being left in a hot car during the summer months in Phoenix. After the tapes were ruined the band was broken up and they were never reproduced. "Packaged very well, cover photos taken in San Diego, lyrics imprinted within the J-Card, recorded at Pantheon Studios, engineered by John Biehl and Scott Adkins, the "SD & AND FRIENDS" 3-song demo release leans more towards (ready for this one?) "Alternative-Metal"! A more "alternative look", powerful metal sound, but "new music" vocal parts and lacking the super-commercial sound of glam metal; hence, "alternative metal"! I'm not sure, but I think this may be the first release I've heard from Pantheon Studios, but I'd like to hear more as the sound quality seems pretty cool. Chester Bennington's lead vocal style does make him a little hard to understand in some areas of this tape and it can get a bit repetitious. However, in other areas I really enjoyed his unique style. Chris Goad provides listeners with some pretty decent guitar licks (a little metalish flash), some interesting effects, and some cool changes, while Jason Cekorictills with some pretty average to cool bass parts. Sean Dowdell on drums seems to have no problem holding the bottom end with Jason but I think his bass drum could have been brought up a little more. i think this band will progress with more experience together on the club scene, as I do see some potential and some very good musicianship gathered here. l look forward to seeing them live and to hearing more material on upcoming releases." This page was last edited on 24 August 2018, at 20:55.